For his next project, he’s building a web for open, linked data that could do for numbers what the Web did for words, pictures, video: unlock our data and reframe the way we use it together. Sir Tim Berners-Lee, the creator of the world wide web, in his address to the British Parliament today warned MPs and peers that they should not allow third parties, including commercial companies, to snoop on people’s internet browsing. 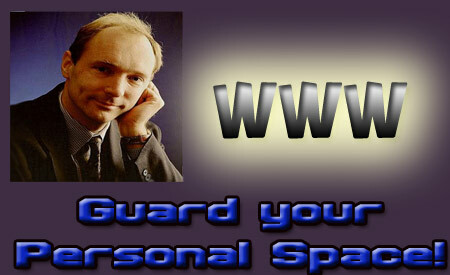 “We use the internet without a thought that a third party would know what we have just clicked on,” Berners-Lee said. “Yet the URLs [webpages] people use reveal a huge amount about their lives, loves, hates and fears. This is extremely sensitive information. Today is the WORLD WIDE WEB’s 20th birthday. It’s been an amazing journey in only 20 years. He said people “use the internet to inform ourselves as voters in a democracy”, adding: “We use the internet to decide what is true and what is not. The WWII era with its postwar capitalist bubble is now extinct. The 100-year-old edifice of capitalism is cracked. It finally began its death throes in the last quarter of 2008 with the great lurching and cascading collapse of the global tower of capital. The whirling, howling, cacophonous wilderness of the global marketplace has taken its inevitable toll on the capitalism system–with its ferocious fads, toxic wastes, and vicious moods, its callous explosions and cruel darwinian extinctions the global marketplace has put capricious end to the blind and righteous rivalry between spoiled and cosseted CEOs in clueless medieval double-entry boardrooms. In Richard Dawkins book, THE GOD DELUSION, he shows how the ancient belief that there are omnipotent GODs who are on-duty 24/7 and are busily and conscientiously intervening in worldly affairs is a medieval pre-scientific belief and is very likely to be also a mental delusion. I have observed, for the past 40 years, that the same may apply to CEOs. The capitalist belief that CEOs can be relied on to ensure the survival and growth of the enterprise is also a delusion and one that is not supported by the evidence (Welch, Jobs and Murdoch are the kind of exceptions that prove the point). This belief has also proven to be a very costly leap of faith for shareholders, employees and customers alike. When you consider the global cost to shareholders of CEOs over the recent era, the ROI has been a dramatic disappointment of Shakespearean proportions. I have written about my belief in Software For Your Brain that we need to go beyond capitalism to intellectual capitalism where the brainpower of the stakeholders–shareholders, employees and customers–is used to lead the enterprise. Sack the CEOs and harness the enterprise brainpower to grow the business! Shareholders around the world have seen extravagant expenditures of their wealth squandered by loitering CEOs with their arm-waving and talmudic reading of balance-sheets and P&Ls, like the obsessive pre-scientific study of entrails, when less than one CEO in a hundred could give an intelligent, educated account of what strategy it would take for their business to survive in the fast-changing, darwinian environment of the next decade. Like the Theory of Communism, which lasted 70 years before it became obsolete, The Theory of Capitalism is dead. Bereft. Discredited. Empty. Depressed. 2008 began the global assault on capital which has so overwhelmed the market that we find ourselves in an economic war involving every national economy in both hemispheres. A war which I’ve called WWIII: The Great War on Capital of 2008. Even the guru of capitalists, Warren Buffett, admits the US economy has “fallen off a cliff”, describing the crisis as “an economic Pearl Harbour”, as concerns spread about the US administration’s fitful attempts to halt the collapse of the US banking sector. The leading investor, an informal adviser to President Barack Obama, whose financial diagnoses are widely respected — although he conceded he failed to predict the severity of the crisis — said the economy had come “close to the worst case” imagined, and that recovery would be slow. Mr Buffett, one of the wealthiest capitalists in the world, said the entire banking sector had been hours from collapse in September, and would have imploded without the $US700billion ($1trillion) Wall Street emergency bailout. (This is an SOT preview. This article will be published in the April edition of Australian Anthill magazine). Michael in Brisbane on Sat 28 and Sun 29 for Masterclasses at Ideas Festival. Michael will be presenting 2 different masterclasses (2 hours each) at Brisbane’s famous Ideas Festival at the end of this month. The tickets are $40 and can bookings can be made here at the Ideas Festival site. Sat 28 Mar 09 2:30pm to 4.30pm. Sun 29 Mar 09 10:00am to 12 noon. Can love change your mind? 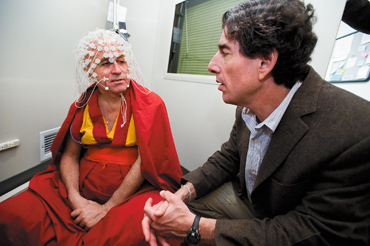 Wearing a 128-channel geodesic sensor net, Buddhist monk Matthieu Ricard sits in a soundproof room and talks with Richard Davidson before participating in an electroencephalography (EEG) test at the EEG facility at the Waisman Center in June. Davidson, director of the Waisman Lab for Brain Imaging and Behavior, recently received a grant to create a new research initiative on the neuroscience of compassion, love and forgiveness, where he will investigate how those virtues work in the human mind. What is happening in the minds of people who have developed a greater capacity for forgiveness and compassion? Can a quality like love – whether it’s shown toward a family member or a friend – be neurologically measured in the brain?